Will My Child Sleep Better With Orthotropics? Did you know that breathing issues may lead to problems with your child’s ability to sleep? 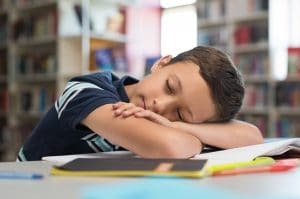 Without proper rest, school performance can suffer and behavior issues may develop. In order to help children rest easier and avoid complications later in life, we may suggest orthotropic treatment for kids in Livonia, MI. What Causes Issues with Sleeping? If one or more of these symptoms applies to your child, then contact our office. We can examine their smiles and oral tissues or see if they require treatment. Children with obstructed breathing due to the development of oral tissues are often misdiagnosed as having behavioral issues, such as ADD and ADHD. They may begin to struggle in school, fall behind, or not reach emotional milestones on time. As they grow older, the risk of misalignment and sleep apnea increases, leading to additional negative impacts on their smile and overall heath. Will an Oral Appliance Help? We often help children as young as age three with an oral appliance. The custom-made device will be worn as the child sleeps. Over time, the device actually guides the growth and development of the jaw and the oral tissues, which helps ensure unencumbered breathing during the night. Children obtain better rest and tend to perform better in school and at home. DOES YOUR CHILD HAVE ISSUES WITH SLEEP? Lack of sleep impacts a child in a number of negative ways. Fortunately, we can help with orthotropic treatment. James Stewart, DDS, and our team serve patients from Livonia, MI, as well as Farmington Hills, Farmington, Plymouth, Northville, Novi, Dearborn Heights, Dearborn, Garden City, Westland, Redford, and the surrounding communities. To schedule a consultation, call our office today at (734) 425-4400.